In perusing the interwebs for inspiration of the parsnippy variety I wandered across this Irish saying which involves said vegetable; "Soft words butter no parsnips". 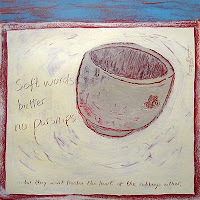 It's supposed to mean that kind words will not put food on the table, hence the empty bowl in the painting. 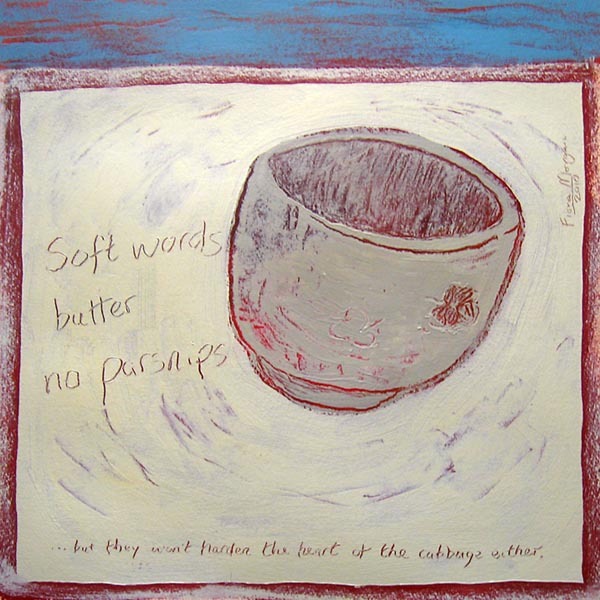 The full saying is, "soft words butter no parsnips but they won't harden the heart of the cabbage either", which I interpret as, although kind words won't put food in your bowl, they won't do any harm either. I'm happy to be corrected. Style-wise this piece is after Irish artist Anji Allen who specialises in the beauty of everyday objects, often related to food. I first came across parsnip chips in Scotland. They arrived on my plate along with a vegetarian haggis that I was trying in a cafe. I think it might have been the wonderful 'Lost Sock Diner' of Edinburgh which was helpfully attached to a laundromat. A useful, no genius, setup. Anyway, back to the food. The haggis wasn't bad, really. The Scots have had hundreds of years perfecting cooking with oatmeal, turnip, salt, pepper and not a lot else in the vege department. However it was the sweetish, crunchy parsnip chips that really grabbed my attention. And then my friends mentioned how unimpressed they were as parsnips chips were so easy to make at home. What?! Of course I had to try making them myself. Note well that like tomatoes, organic parsnips have a LOT more flavour than their supermarket cousins. Heat your oven to around 215 C. I have found 200 C to be too low - the chips end up oily and soggy - and 230 C to be too hot - the chips burn as they cook. You will have to experiment a little because all ovens vary. Figure out how many trays you need by test-placing the chips on trays in a single layer only. Remove the chips and lightly cover the tray with oil. Put it in the oven when the oven has reached temperature. Leave it long enough to heat the oil up. Clue - if it's smoking it's definitely hot enough! Meanwhile, put all the chips in a bowl, drizzle with olive oil and season generously with salt and pepper. Toss to coat all over. When the oiled tray is hot enough, tip and spread the chips out on the tray. Cook up to another 15 minutes. They may take less time as parsnips burn easily on account of their high sugar content so keep an eye on them.